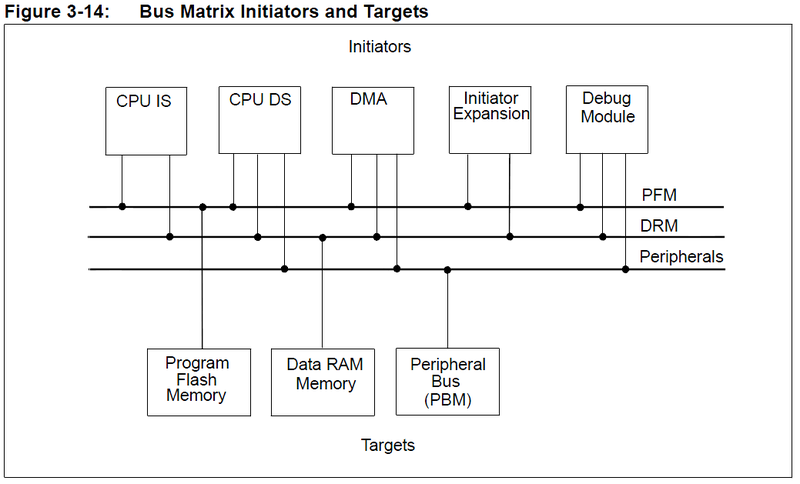 The PIC32MX family of devices incorporates a System Bus Matrix, which is implemented as a multilayer fabric that allows concurrent transactions by multiple initiators (bus masters) to multiple targets (bus slaves). There are no arbitration delays unless two initiators attempt to access the same target at the same time. Initiators include the CPU, the general purpose DMA, and the bus master peripherals with dedicated DMA access. Advanced features of the Bus Matrix Module, such as RAM/Flash memory access allocation will not be discussed here. If you want to run code from RAM or set up user mode partitions, you need to configure those specific BMX registers. Refer to Section 3 of the PIC32MX family reference manual for a detailed discussion of these features. Of the five possible initiators, the CPU Instruction Bus (CPU IS), CPU Data Bus (CPU DS), In-Circuit Debug (ICD) and DMA Controller are the default set of initiators and are always present. The PIC32MX also includes an Initiator Expansion Interface (IXI) to support additional initiators for future expansion. 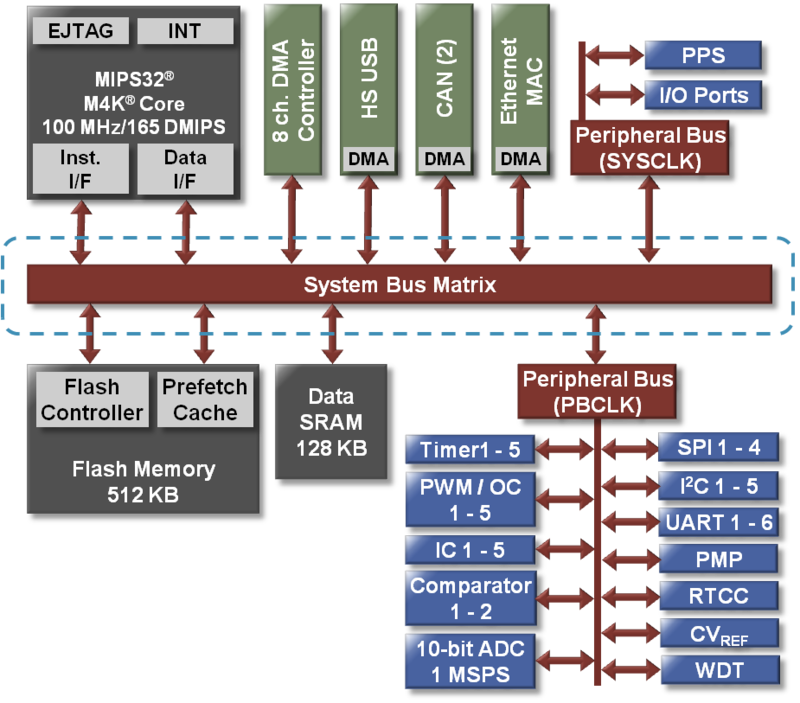 Some peripherals are grouped together as a single target to form a Peripheral Bus, which shares a target interface in addition to sharing a common peripheral bus clock source (PBCLK). Since there can be more than one initiator attempting to access the same target, an arbitration scheme must be used to control access to the target. 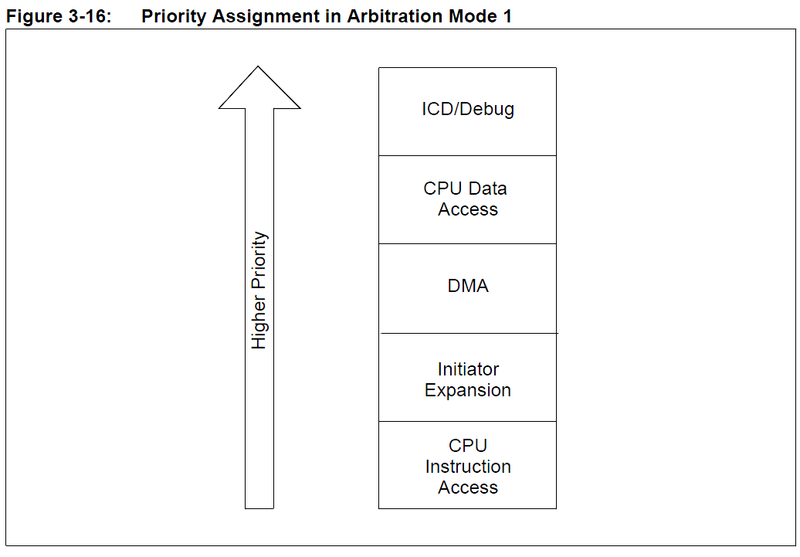 The arbitration modes assign priority levels to all the initiators. The initiator with the higher priority level will always win target access over a lower priority initiator. A detailed discussion of arbitration settings is beyond the scope of this tutorial. Refer to Section 3 of the PIC32MX family reference manual for a detailed discussion of these features. Bus Error Exceptions may be temporarily disabled by clearing the BMXERRxxx bits in the BMXCON register, which is not recommended. The Bus Matrix disables bus error exceptions for accesses from CPU IS and CPU DS while in DEBUG mode.